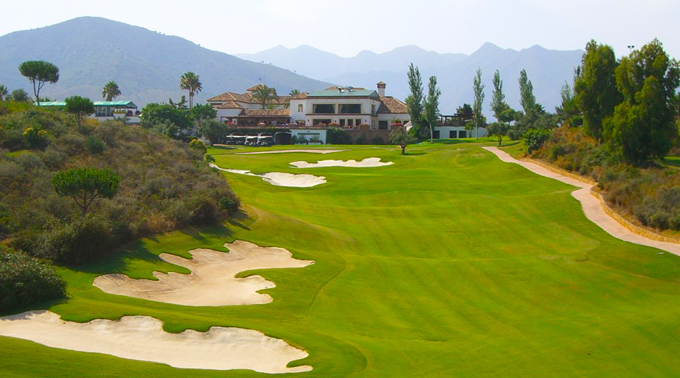 The latest stop on the Gecko Pro Tour was the impressive Asia course at the La Cala Resort, designed by Cabell Robinson, who was a protege of the legendary Robert Trent Jones. From the early banter and chat in the dressing room, everyone was in agreement the course was in superb condition. The greens and fairways were looking like billiard tables, and the players were eager to get underway to compete for the 2,000 Euros first prize. Day 1 saw European Tour player Peter Gustafsson teeing up for his first appearance on this years Gecko Pro Tour. Other players from all over Europe converged on this beautiful part of Spain, including the talented Spaniard Gabriel Canizares. With the sun shining and a gentle breeze, scoring was very good on this tough track. First out of the blocks was Estonian number 1, Mark Suursalu who was 3 under after 14 holes. He safely negotiated the last 4 holes in level par to post an opening 69, this was matched later in the day by Gabriel Canizares. There were also solid rounds from Englishman Adam Sagar, who shot an opening round 72 and young amateur Charlie Hagger who shot 71. Day 2 saw similar conditions, perfect for those players who were playing catch up. One of those was David Griffiths who was 3 under the card for his opening 9 holes, leaving him just four shots off the pace. The leaders were playing a cagey affair with opening pars, but two bad holes by Mark Suursalu took him from three under to +2 leaving him to claw his way back up the leaderboard. Gabriel Canizares was now the man in control, four clear of the field he took the turn in a level par 36. The canny Spaniard knew that the others had to catch him and used all his experience and played strategic golf on the back nine. His level par 72 gave him a -3 141 total for the two rounds to take the Championship. David Griffiths final round charge of 69 moved him into 2nd place, with Peter Gustafsson a further shot behind to finish 3rd. A special mention goes out to Young amateur Charlie Hagger who won the Amateur prize with excellent rounds of 71, 74.